Bawal Clan: Bobby Bobbito — The Third World • Community driven and built by culture – Streetwear, sneakers, photography, music, art and lifestyle. 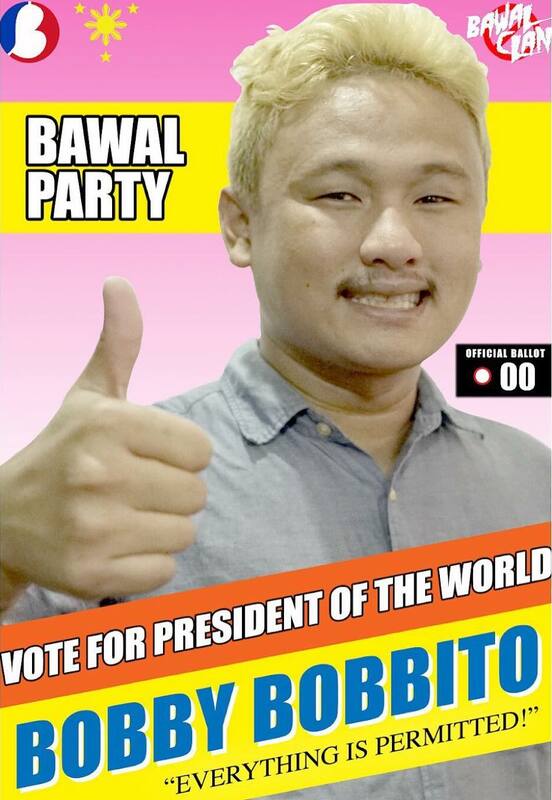 MANILA, PHILIPPINES, March 20, 2019 – Bawal Clan launches a new music campaign that takes its art direction from the Philippine elections, and releases their new music video entitled “Bobby Bobbito”. Bawal Clan is a hip hop/design oriented collective, comprised of hip hop artists, vocalists, music producers, DJ’s directors, photographers, videographers, and graphic artists. Some of the hip hop artists being in the music industry for a decade - it shows a vast range of experience and knowledge of how to make it as a musician. They have all joined forces to make a super group of talented artists to make an imprint in today’s music scene. Completely independent and without association to any major music labels - they are focused to make music that will resonate outside of the Philippines, and spotlight the talent that is here in the country. The campaign “Bobby Bobbito” is a series of short video clips/design collaterals that lead to Bawal Clan’s new music video also entitled “Bobby Bobbito”. Bobby Bobbito is now streaming on Spotify and Youtube under Vevo.